Fresh okra is one of those great farmers market finds, and there are many ways to cook it besides breading and frying okra. When fresh okra is sautéed whole it stays crunchy and firm, which is appealing to those of us who like the taste of okra but are dubious about the "slime" factor. 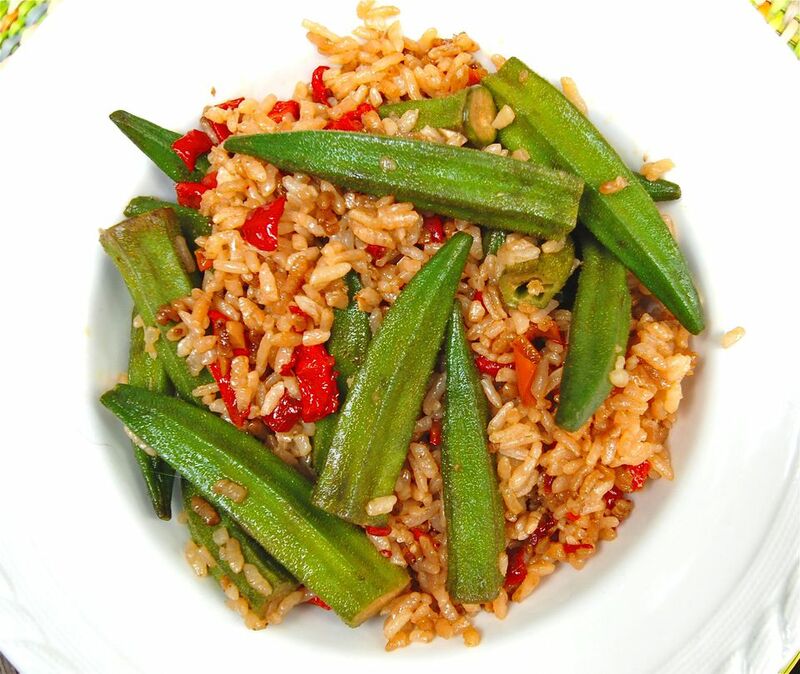 Fried rice with okra makes a great weeknight dish, it only takes minutes to prepare and is a great way to use leftover rice. This kind of dish is perfect for experimentation with other ingredients you have on hand, such as vegetables, chicken (such as leftover roasted chicken), and sausage. When adding meat to this dish, cook the meat first, then add the vegetables, and then the rice. Trim the stems from the okra, taking care not to cut into the inside of the okra where the seeds are. Chop the onion finely and mince the garlic. Heat the olive oil in a heavy skillet or wok over medium-high heat. When the skillet is hot, add the okra and cook, stirring often, until okra is crisp-tender, about 2 to 3 minutes. Squeeze the lime juice over the okra. Remove the okra to a plate and set aside. Add the onion and garlic to the skillet and cook until the onion is very soft and fragrant. Add the chopped red pepper to the skillet and cook for 3 to 4 minutes, or until softened. Add the rice, soy sauce, and teriyaki sauce to the skillet and cook, stirring, until rice is heated through and well mixed with the vegetables. If the rice sticks to the skillet, add a little water or some additional soy sauce (to taste). Add the okra back into the skillet with the rice and stir until the okra is heated through. Taste for seasoning, adding more soy sauce or teriyaki if desired, and serve warm.